Sunday we loaded batch #2 of chickens out to the processor. It’s always interesting to see what our numbers end up to be. I try to keep track of how many we start with and how many we end up with, but I miss some here and there. We always wonder if the hawks or owls or eagles have taken any without us being aware of it. And then there’s Titus. 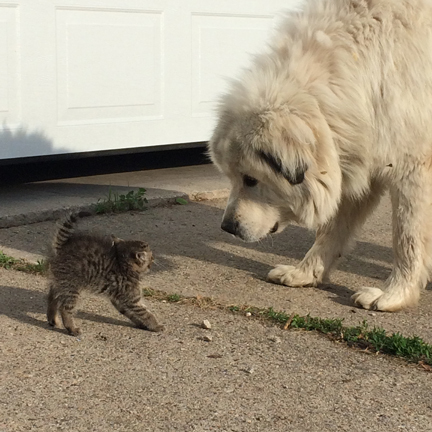 Titus is more scared of new kittens than they are of him. But by now they are best of friends. 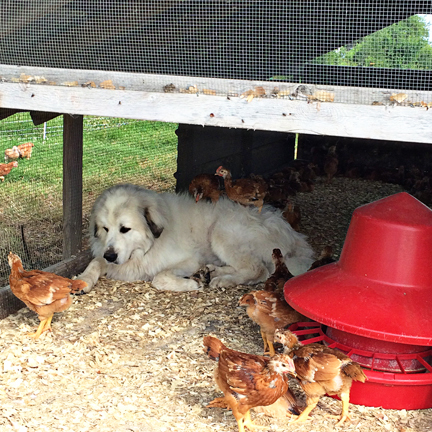 On the flip side, he’s mostly very gentle with them. 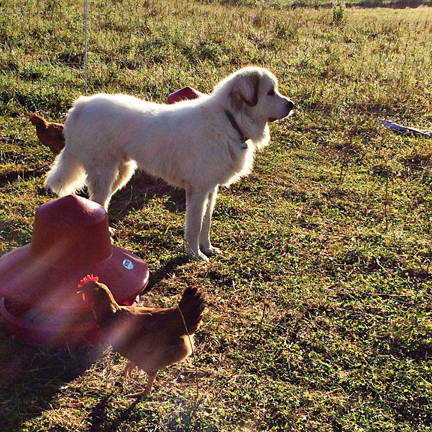 If I bring food out for him in the chicken pen, the chickens try to take it and he just gently noses them away. And he doesn’t mind if they sit on him. So we were quite curious to see what story the numbers would tell. There have been a lot of hawks hanging around the pasture this summer. 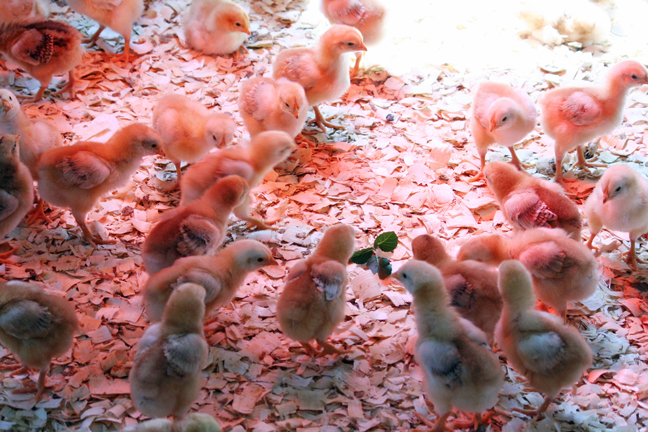 They sit in the trees at the perimeter, screeching as they fly over the chicken pen. As it turned out, Titus deserved a great big bone for his work. We only lost 12 out of 186, which is a 6% death loss. And some of those losses came before they went on pasture with Titus. We can most definitely live with that. We count anything under 10% as a victory. It’s August. Everyone, including me, is wondering where the summer has gone. It’s been a glorious summer, weather-wise. Rain at just the right times. Not an excessive amount of heat and humidity. And I have been doing my best to soak it all in. On my morning walks to the chicken pen I’m soaking in the feeling of warm sun on the back of my neck, and cool breeze on my bare arms and legs. 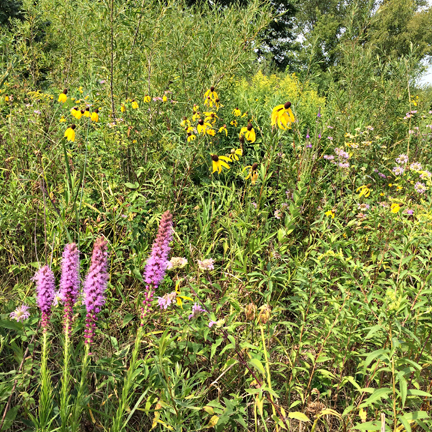 I’m soaking in the vibrant colors of wildflowers in the ditches, and the smell of blooms. 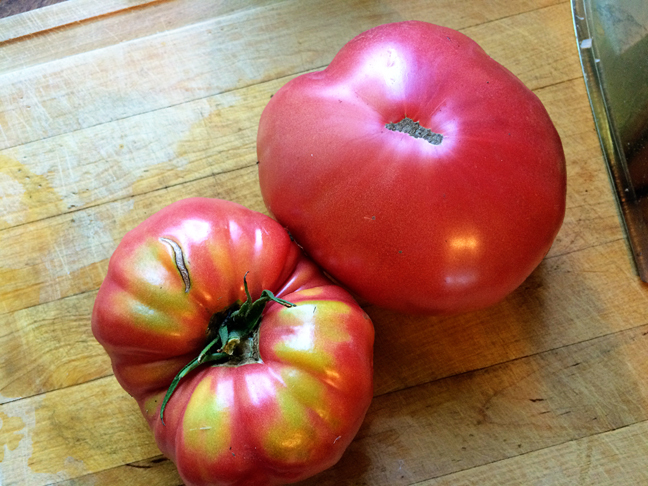 I’m soaking in the taste of fresh garden produce; the joy of walking out our back door, poking around the garden to see what’s ready, and then coming up with a supper menu on-the-fly with whatever vegetables I’ve filled my arms with. I’m soaking in being a family of five under one roof for just a couple more weeks until Madeline returns to college. 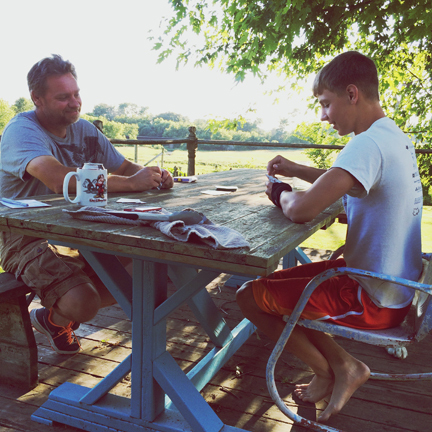 I’m soaking in time around the table that Rafe built for his 4-H project last year, which now sits on our back deck. We play card games there, we eat meals out there. It looks over the creek and pasture, which provides such a great backdrop. We eat supper with binoculars close at hand and take turns observing all of the waterfowl that enjoy Sugar Creek. I’m soaking in the start of Olivia’s senior year of high school. It’s a mix of feeling nostalgic and a bit sad about another one leaving our nest, and pride at the wonderful and unique human being she’s become, and excitement to see what comes next for her. 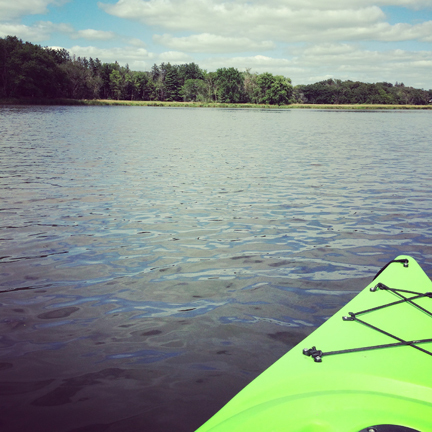 I’m soaking in time spent in kayaks with my best friend. I’m soaking in time spent reconnecting with old friends, and connections made with new friends. 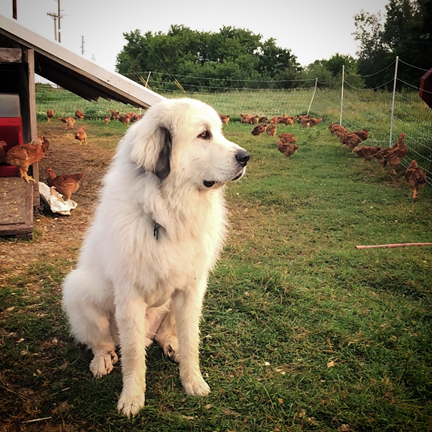 I’m soaking in twilight, which is when I walk around watering my flowers and watching the dogs chase each other around when Titus returns from his duties at the chicken pen. 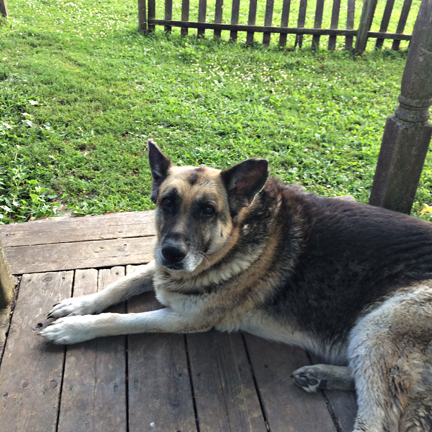 Ava will be 10 in the spring. We’ve had her on a diet this year, and she’s become much more active again. Helps to have Titus around to get her moving. It’s easy to soak it all in when you’re in your favorite season. My challenge is to soak it all in with the same sense of joy and gratitude in times when it’s not as easy to do. Remember the first post in this series, where I mentioned that I had bought the food, prepared the food, and taken pictures of the food, but didn’t get around to posting about the food right away? Apparently that happens a lot. So playing catch-up again, here is June, Week 2! 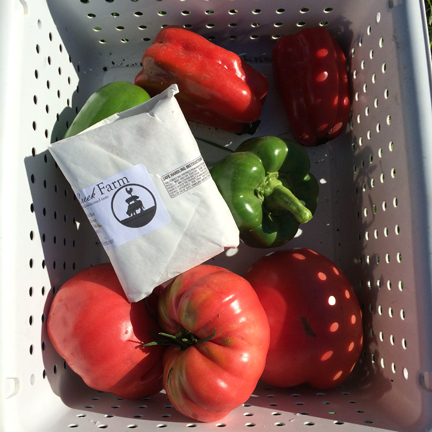 This week we were at the Osage Downtown Farmers Market. This market happens 8:00 to noon on the 2nd Saturday of the month, June through September, just south of the intersection of 7th and Main. It’s a small but really diverse market. This particular day there were 6 vendors that included flowers, strawberries and veggies, baked goods, soaps, homemade jam, and of course our meats and Olivia’s pies. Impressive for a small market, I think! So soft and just the right amount of sweet! 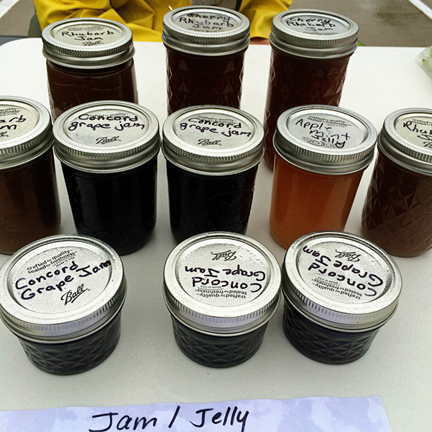 One vendor was selling homemade jam. 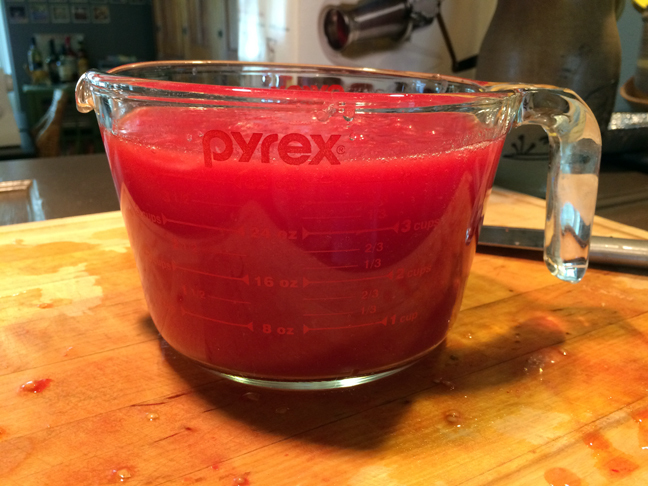 Rhubarb is one my favorite things on earth so I couldn’t pass up a jar of cherry rhubarb jam. She said it was her best seller and I can see why! I’ve been enjoying it on toast, but thinking I’m going to have to play around with using it in a marinade with some chicken. 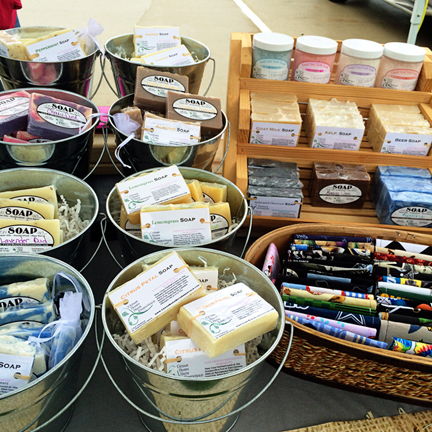 Another vendor had a beautiful display of soaps, scrubs, shaving kits and lib balms. I picked up a minty lip balm and I love it! Very nourishing for dry lips! 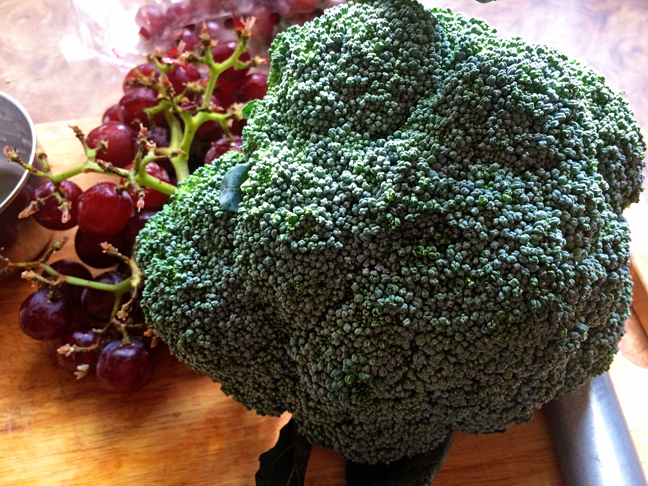 Finally I picked up a bunch of onions and a beautiful head of broccoli. I put these together in a broccoli salad. Usually I use dried cranberries in this salad, but since I had a bag of purple grapes languishing in the fridge I decided to use those instead. I feel like such a superhero when I rescue languishing food and put it to good use before it becomes a science experiment! We had the broccoli salad for a simple supper with some of our grilled hamburger patties. I didn’t get a picture of the plate. You guys, I get hungry and completely forget about photography! 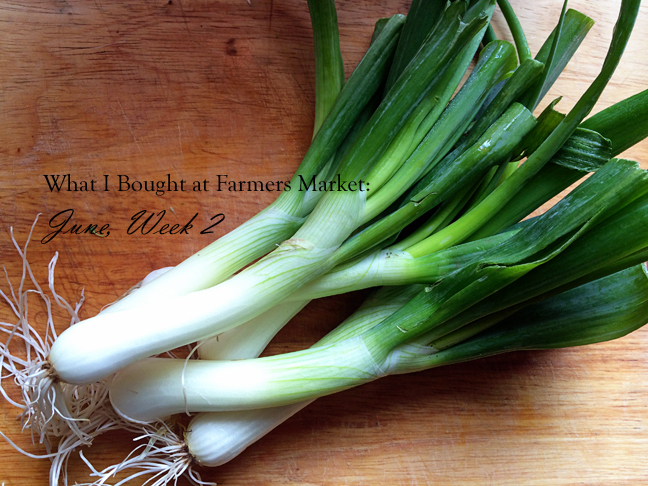 What are you buying at farmers market lately? And how are you using it? Fry bacon until browned. Drain and crumble. Combine bacon pieces with sunflower seeds, broccoli pieces, diced onions and grapes. Whisk together remaining ingredients for dressing and pour over broccoli mixture. Cover and refrigerate until serving. When I’m selling at market I usually try to buy some things to take home as well. 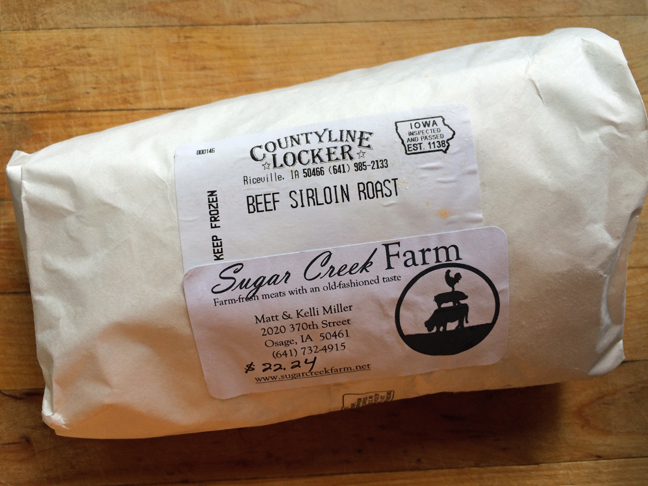 A couple of weeks ago I had the idea to start a weekly post on what I bought at the market that week, what I did with it when I got home, and which of our meats I paired it with. The first weekend of June I bought the food, prepared the food, took pictures of the food… but didn’t get around to posting about the food. Until now! If I’m going to shop at market it’s either during a slow moment, or if I have help. 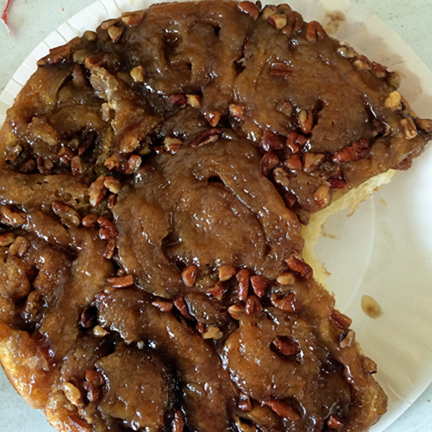 The first week of June I was at the Clear Lake Farmers Market, and I had Rafe along. But Rafe doesn’t feel confident enough to run things by himself yet, so I sent him out to do the shopping. First things first, I wanted rhubarb and it goes fast at market! 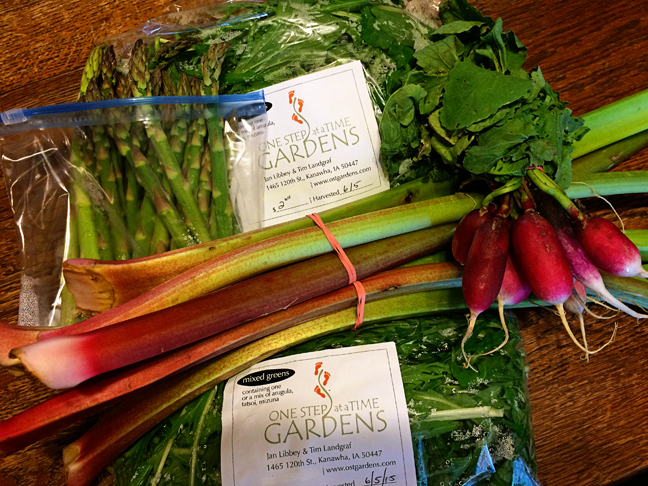 After he procured the rhubarb for me, I sent him back out for “something green and leafy”… lettuce, spinach, whatever he wanted to buy except for kale or chard. I was trying to avoid the bitter greens that I didn’t think most of my family would eat. What did he bring back? “Mixed Greens”, consisting of arugula, tatsoi and mizuna. I wasn’t sure how bitter that mix would be or how the fam would like it, but I was excited for the challenge. Finally I sent him for some radishes. Yes, this is a lot of back-and-forth. Yes, this is my strategy for keeping a squirrely 13-year-old boy occupied at market. So this was my haul: rhubarb, 2 bags of mixed greens, radishes, plus some asparagus from a friend. Yum! The asparagus I simply steamed and salted. 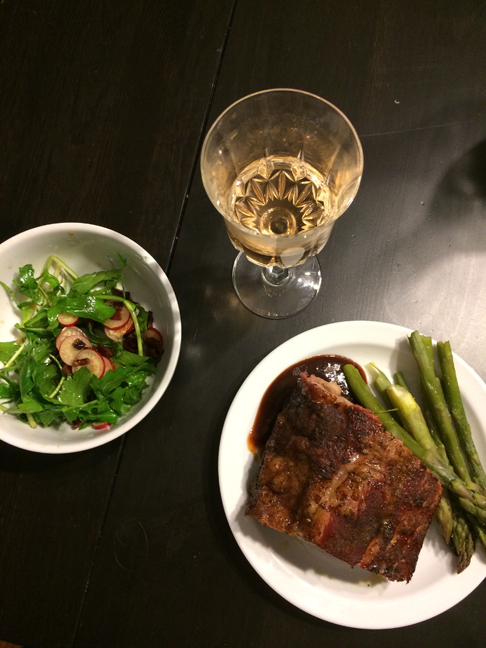 We paired everything with some ribs slow cooked on the smoker, courtesy of Madeline’s boyfriend Dustin. 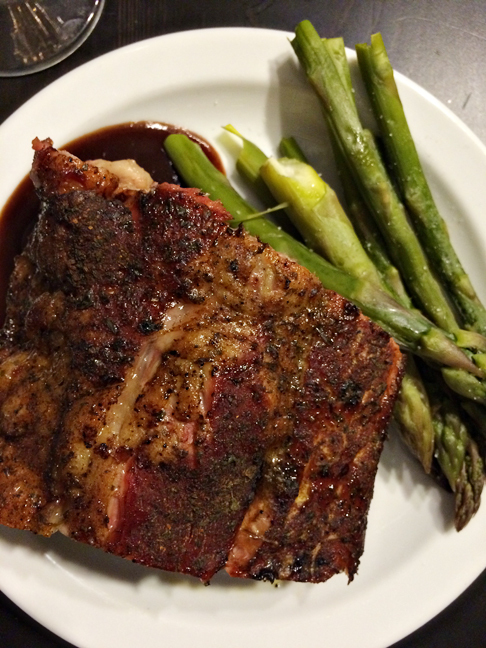 You could also use my usual rib recipe with our beef short ribs. A glass of wine and we had ourselves a feast! 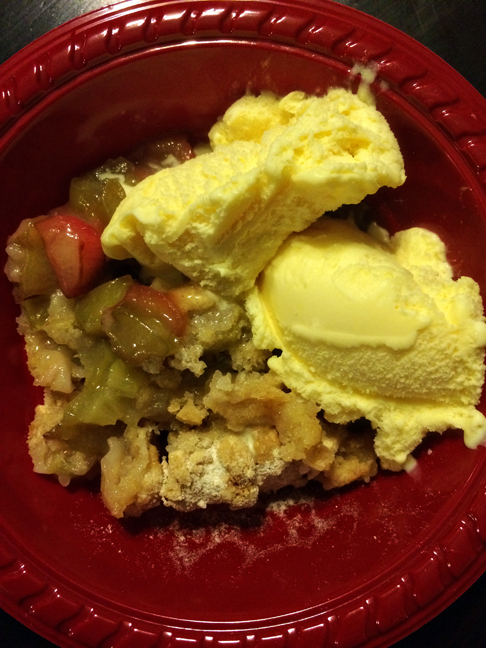 Warm from the oven with some vanilla ice cream on top… perfection! 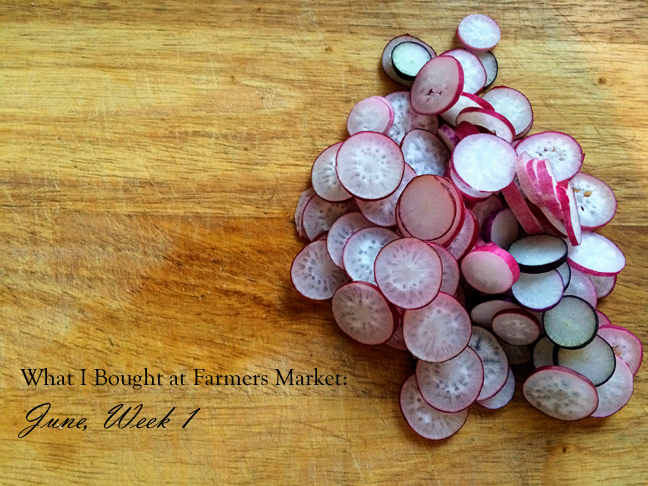 What did you buy from the farmers market this week? 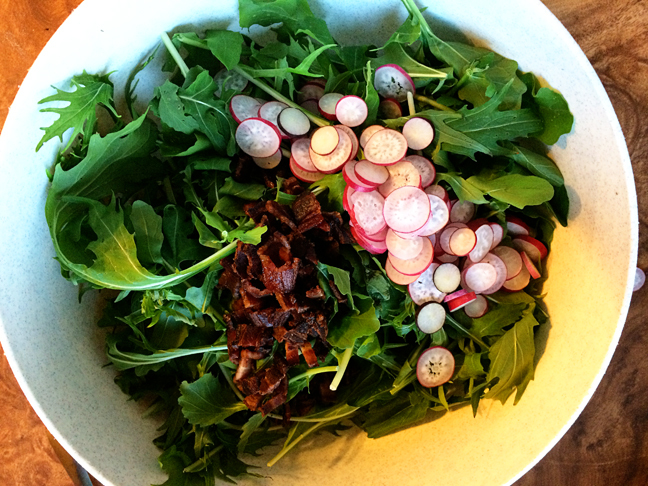 Place mixed greens, sliced radishes, bacon crumbles and choice of nuts in large bowl. 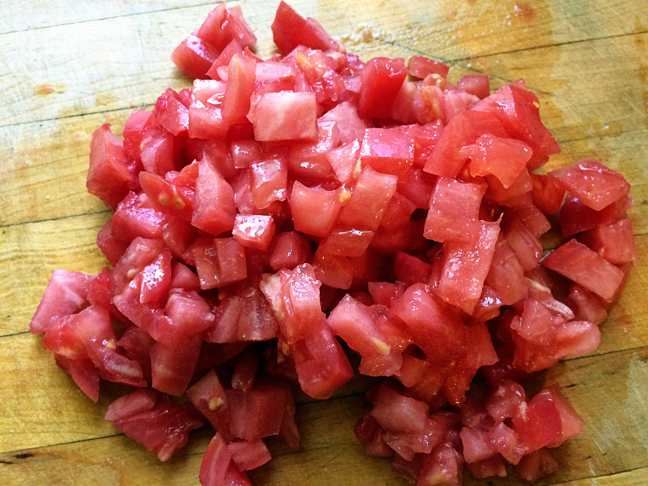 Combine olive oil, red wine vinegar, sugar, salt and garlic in a small sauce pan. Warm over low heat, whisking dressing ingredients until smooth. Pour over salad and toss to coat. 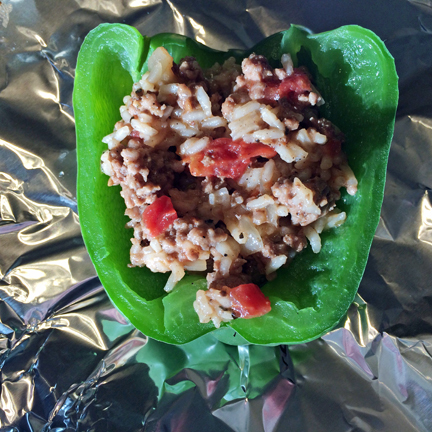 Combine above ingredients and pour into 9×13 pan. Combine, making a lumpy batter. Pour over rhubarb mixture. Sprinkle with cinnamon. Bake 45-50 minutes. It all started with tortillas. My sister-in-law asked if they could bring us anything from Texas when they came to visit Memorial Day weekend. Since shrimp doesn’t travel so well when you’re flying + driving, we settled on fresh, authentic, flour tortillas. So what to make to go with the tortillas? I considered these pork carnitas. Even though we aren’t raising pork at the moment, we’re still stretching the last of the pork cuts we have in the freezer. I considered trying the pork carnita recipe with a beef roast instead. I considered straight-up tacos with ground beef. And then I wondered, could you make fajitas in the crockpot? A quick Google search said, indeed you can. 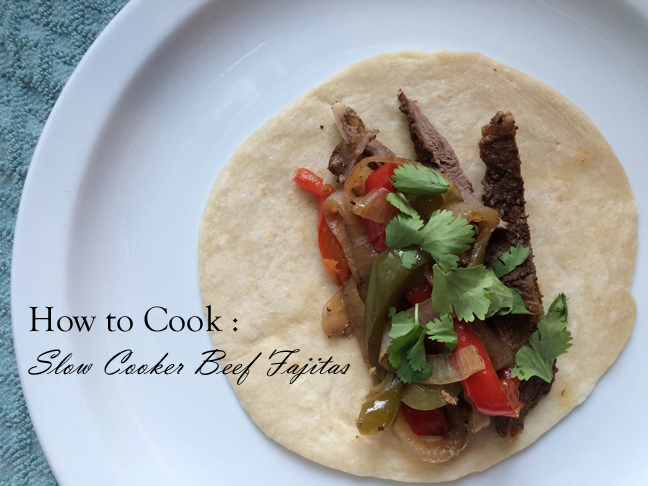 And then I wondered, could you make fajitas with a beef roast instead of steak? Again a quick Google search said, go for it. 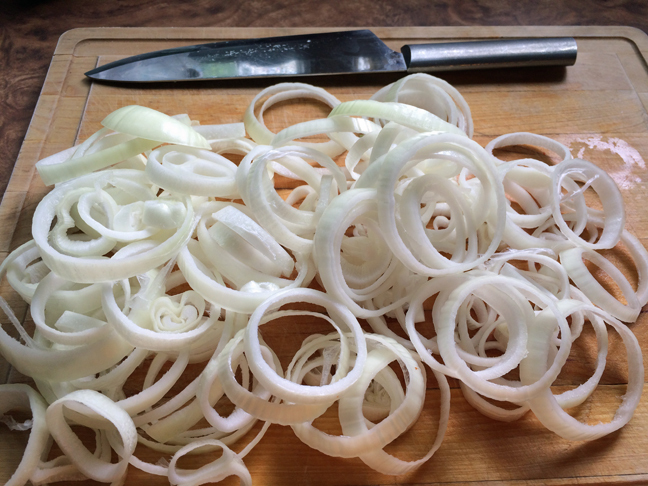 and a couple of onions. Then it was time for the seasonings. 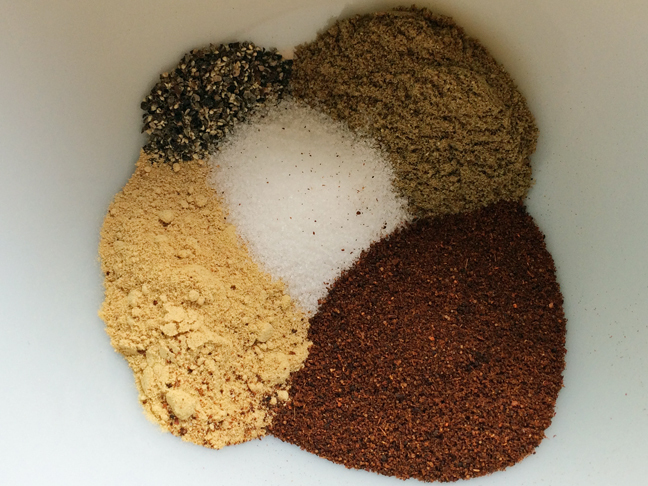 Most of the recipes I looked at called for some combination of chili powder, cumin, coriander, salt and pepper. I didn’t have any coriander, and it’s one that’s hard to substitute for. So I literally started taking the lids off various spices I did have in the cupboard and smelling them to see what might combine well with the chili powder and cumin. Some people might say “weird”. I say this is where cooking becomes a “creative art”. Also, I would rather make a crazy substitution than make another trip to town. I strongly considered a smoked hickory salt I have, thinking the smoky flavor would work well for fajitas and I could just leave the regular salt out. But I was afraid it would come out too barbecue-y. So I ended up going with ginger. The onions get piled in the bottom of the crockpot first, to keep the roast moist from underneath. The seasonings get mixed together and rubbed all over the roast, which then gets placed on top of the onions. 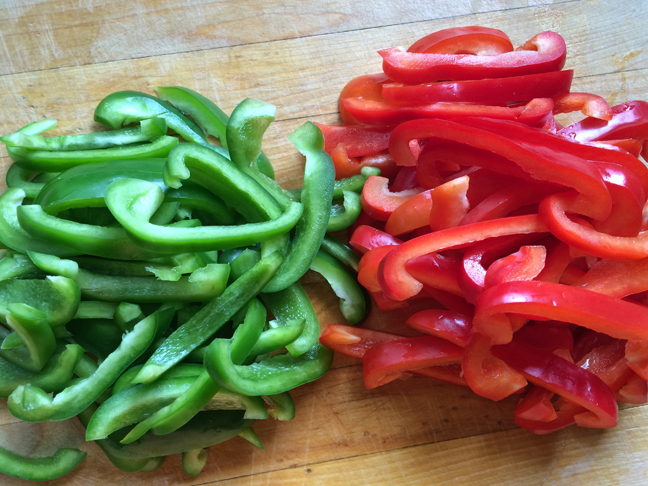 Pile the peppers on top of the roast and sprinkle any extra spice rub over them, as well as some minced garlic and soy sauce. I put the roast in around 1:30 in the afternoon on High and figured we’d be able to eat around 5:30. At 3:00 I checked on it, just to discover I’d forgotten to press “Start”. Oops. But even with a delayed start, when Matt checked the internal temperature of the roast around 6:00 it was at 160 degrees. Perfect! 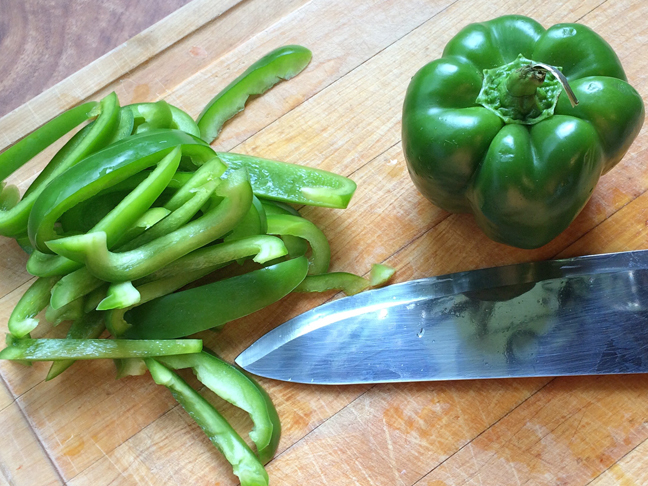 Most recipes called for shredding the meat, and you can sure do that. 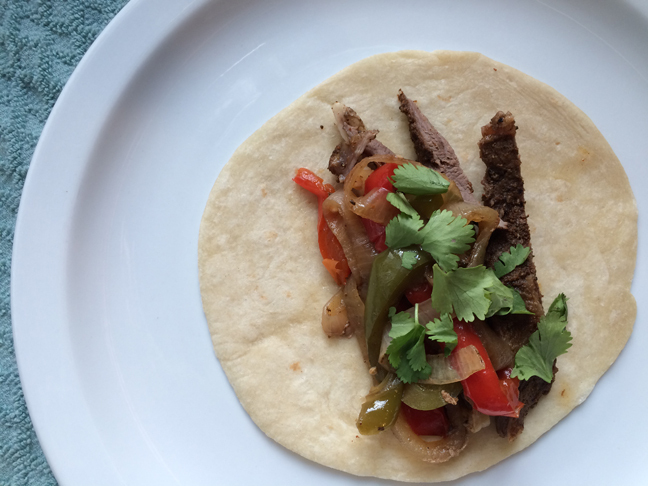 But I wanted the strips of meat like real fajitas so I simply sliced the roast into strips. That’s why a sirloin tip or rump roast works well for this. They hold up well for slicing even after being slow cooked. If you wanted to go the shredding route, a bone-in chuck or arm roast would also work. You might need 4 to 5 pounds of that type of roast to make the same number of servings, to account for the weight of the bone. Also I would cook those types of roasts on low for a longer time so that they easily shred and fall apart when they’re done. Another thing I considered doing, and still want to try sometime, would be to take those strips of beef and fry them in a cast iron skillet with some olive oil before serving. 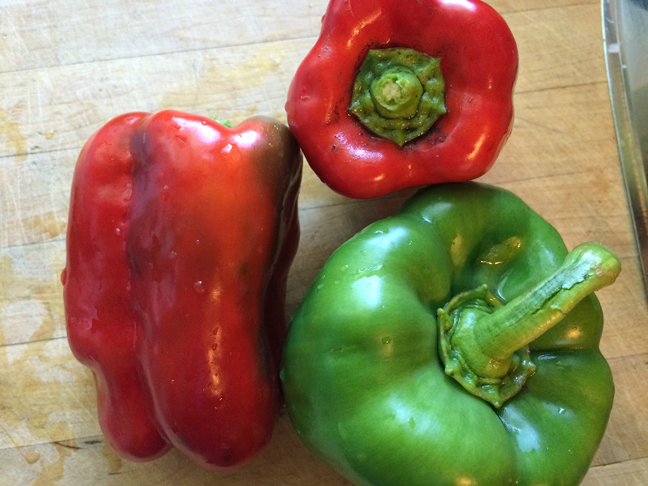 You could also fry the peppers and onions with the meat. That would get you even closer to that authentic fajita experience, I think. 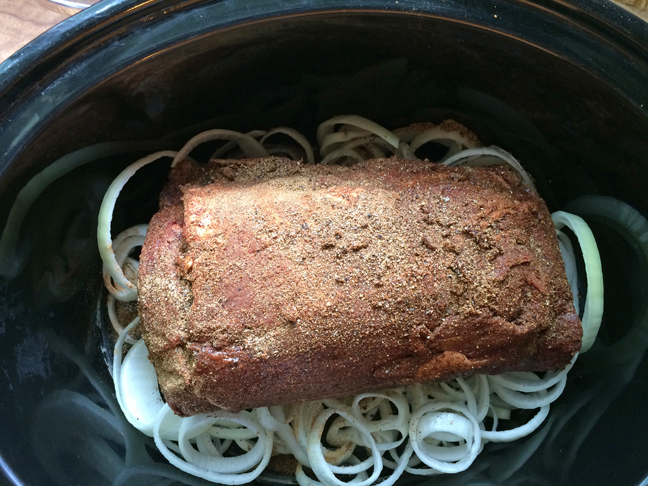 But since supper was already past due, we just went with the beef strips straight out of the crockpot. And they were wonderful! Matt kept his fajita (er, fajitas plural, since he ate many of them) pretty simple, with just the beef, peppers, onions, and a bit of cilantro. I added a couple dollops of sour cream and a bit of cheese to mine. Absolutely delicious! So tell me, are you apt to make weird substitutions like ginger for coriander? Or are you a stickler for following the recipe? 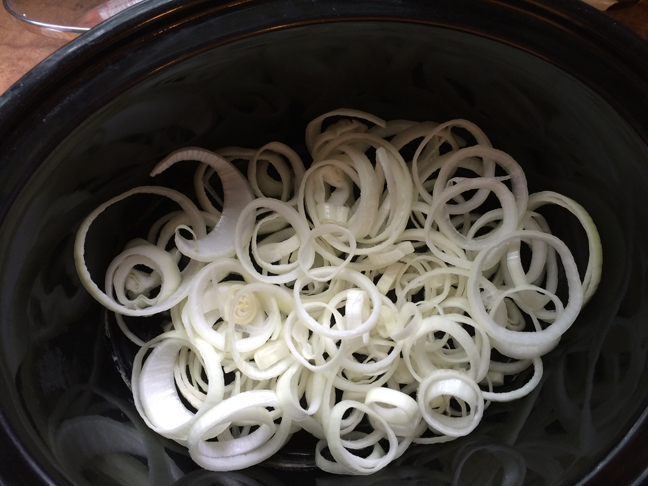 Place sliced onions in bottom of slow cooker. Combine chili powder, cumin, coriander or ginger, salt and pepper. 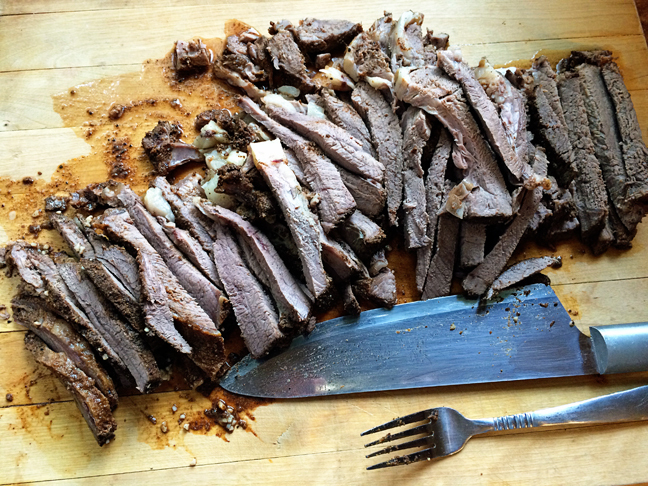 Rub seasonings into and over entire surface of beef sirloin tip roast. Place roast on top of onions. 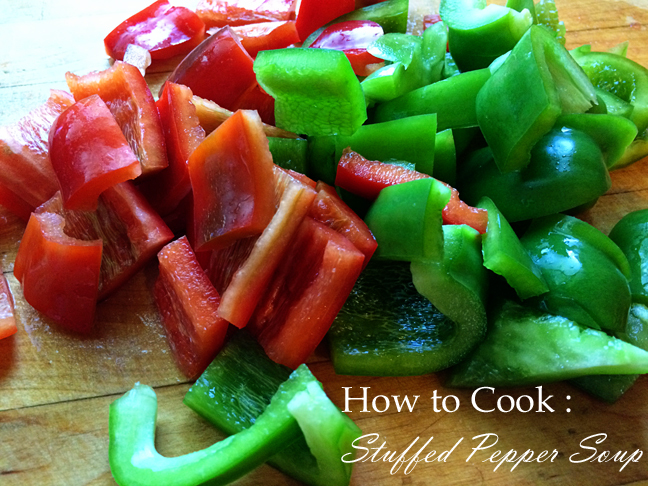 Top roast with sliced peppers. Sprinkle any remaining rub mixture, garlic and soy sauce over peppers. 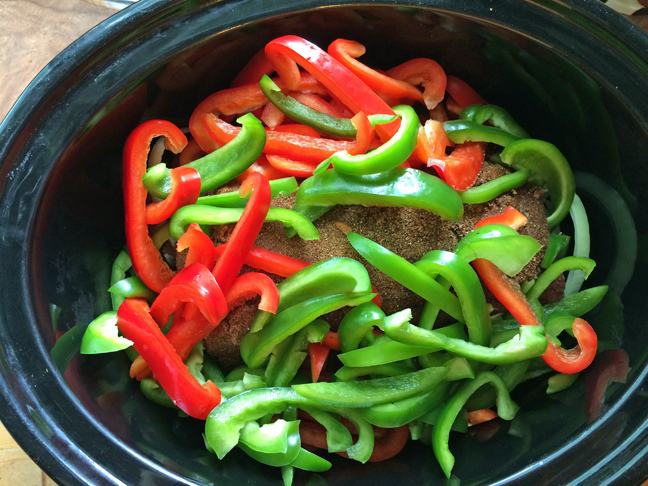 Cook in covered slow cooker on high 3 to 4 hours, medium 5 to 6 hours, low 8 hours, or until internal temperature of roast reaches 160 degrees. Remove roast from slow cooker and slice into strips. 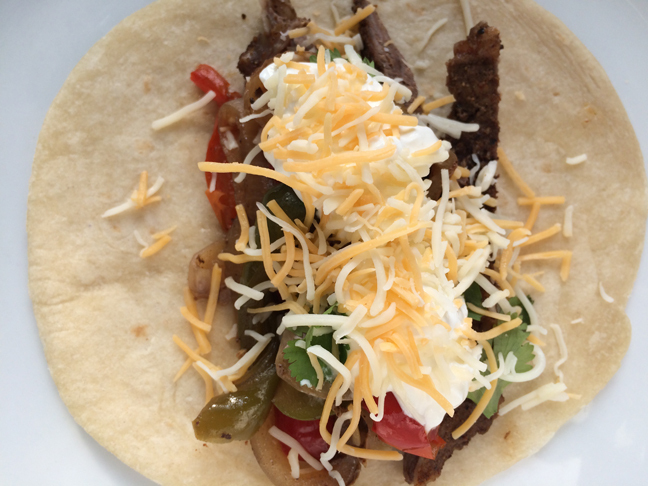 Serve on tortillas and top with the peppers and onions. Those of you who have been with me a long time know that I used to blog a lot. Like, a lot a lot. And I’ve written before (also here) about how or why I just sort of tapered off. I think it boils down to two things: circumstances, and dreams. The dreams part I’ll talk about next week. The circumstances part I think has to do with seasons of life. When your kids get to be teenagers, they’re just busy. And it was (and still is) important to me to be there for them during that season. “Being there” for teenagers looks a little different than what it looks like for littles. Sometimes it means knowing when not to be there. Sometimes it means waiting around all hours for your moment to be there. Sometimes it means making those moments, like in the car on the way to the dentist, or bribing them with a trip to the drive-in for ice cream. 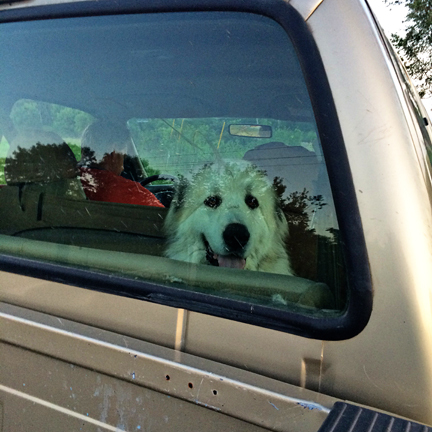 Because car time is the best talking time. They can’t get away from you. And you think your sleepless nights are over when your babies start sleeping through the night? They are, for a while. And then your babies get drivers licenses and boyfriends and curfews and there you are, not sleeping again. For me it’s also meant attending a lot of volleyball/softball/football/basketball/baseball games, wrestling meets, track meets, band and chorus concerts, 4-H functions, etc. And I love (almost) every minute of it. My kids have never made me feel like I’m a bad parent if I’m not there, they understand when I can’t be, but I also know that they appreciate it when I am. And so we cut back on some things around the farm. Some by choice, some by circumstance. Which meant less to write about. The other thing about teenagers is that they generally don’t like you blogging about them anymore, and I’ve tried to respect that. Madeline: People are going to think you don’t even have kids anymore, just dogs and chickens. Me: Well, once you guys got to be teenagers you didn’t really like to be blogged about anymore. Liv: Right, have you ever googled yourself? I don’t recommend it. Madeline: Good point. I did once and what came up was a dance picture of me from the blog when I was about 9 years old and looked like I hadn’t eaten in several weeks. It was awful! But now I’m in college. I give you permission to blog about me all you want. So, to catch you all up… Madeline graduated high school, just finished up her sophomore year at Iowa State, is majoring in Child & Family Services and minoring in Financial Counseling. Stay tuned for more, I guess. Apparently blogs, and teenagers, are cyclical. 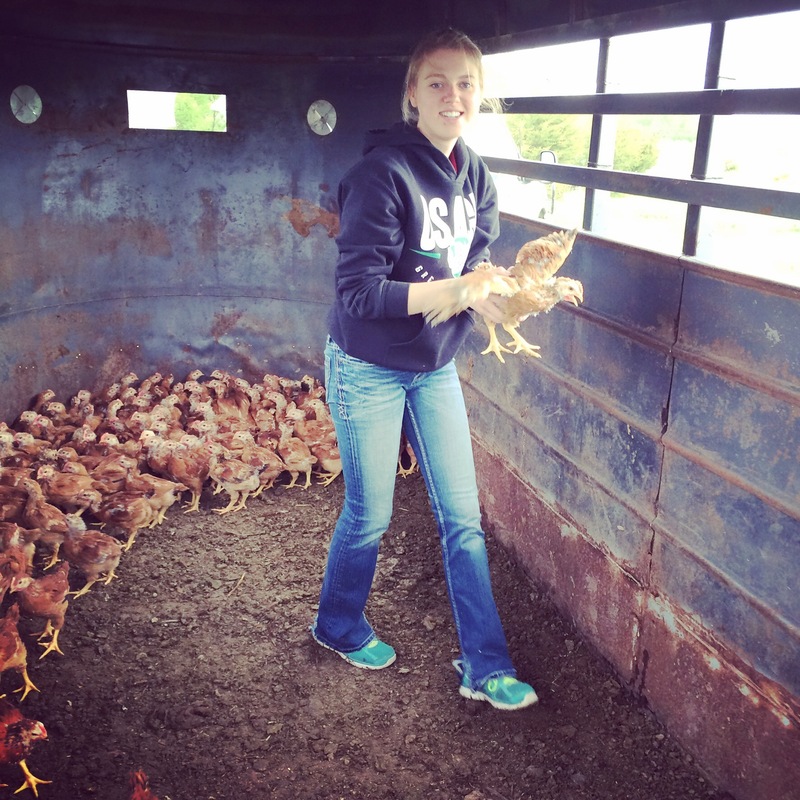 With fresh chickens coming soon – next month! – it’s time for me to get the ones I still have in the freezer used up. Of course I love the internet for new recipe ideas. Sometimes I love it too much. I did a search for “baked chicken”, found two great sounding recipes, and couldn’t decide between them. Both recipes sounded not only tasty, but they called for ingredients that I either already had on hand or had reasonable substitutes for. So I made both! 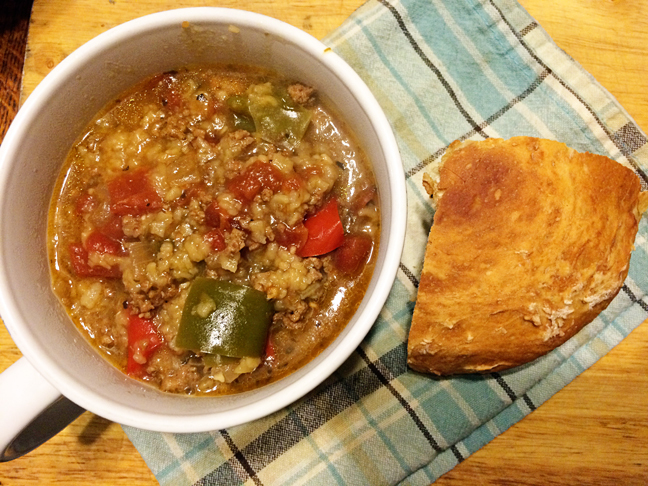 Because I love leftovers even more than I love new internet recipes. 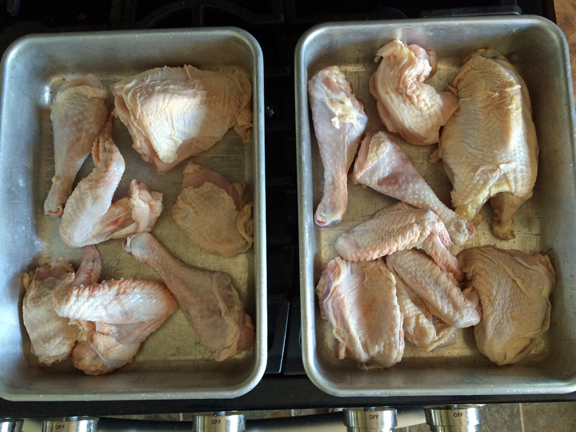 For each recipe I thawed out one of our cut up chickens and put the pieces of each chicken in a 9×13 pan. Both of them called for chicken breasts but they worked just fine with chicken pieces. 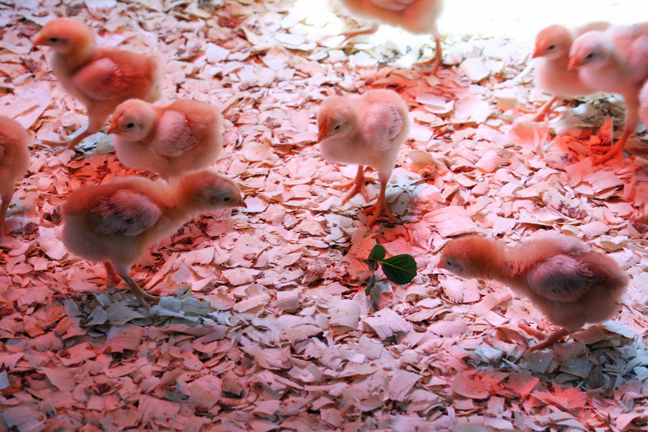 Our cut chickens come in an old-fashioned 8-piece cut, plus back pieces and neck/liver/heart/gizzard. The back pieces and neck I throw in a Ziploc to make stock with later. The other pieces become cat or dog treats. Recipe number one was for Parmesan Chicken Bake from My Kitchen Escapades. It’s one of those super simple recipes where you just mix together a few basic ingredients, spread them over each piece of chicken, and bake. 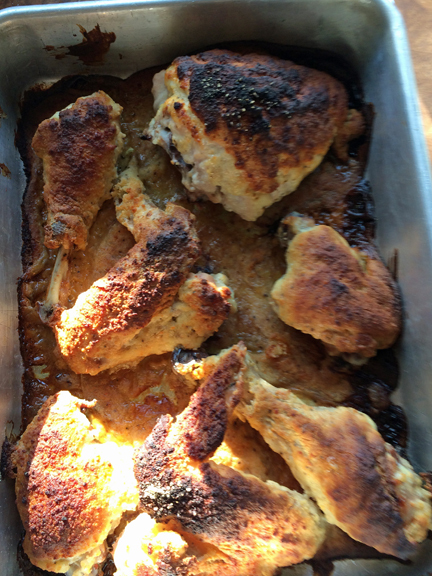 Lots of flavor and very tender! 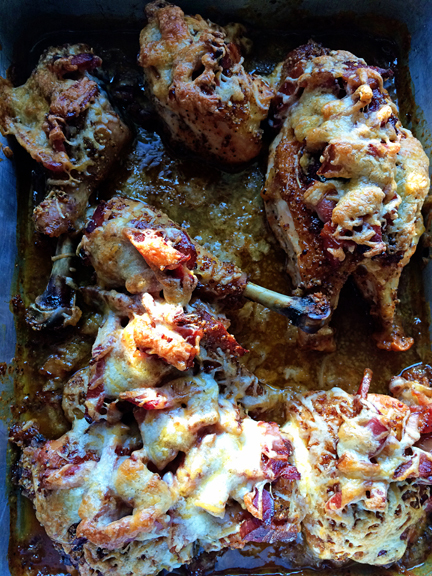 Recipe number two was for Cheesy honey mustard chicken from Plain Chicken. Also super simple! 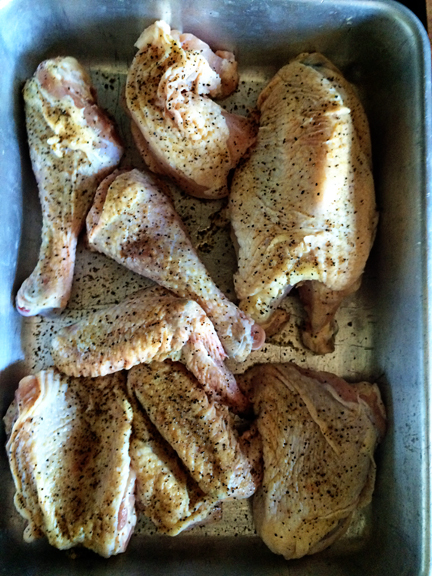 Begin by seasoning with lemon pepper. 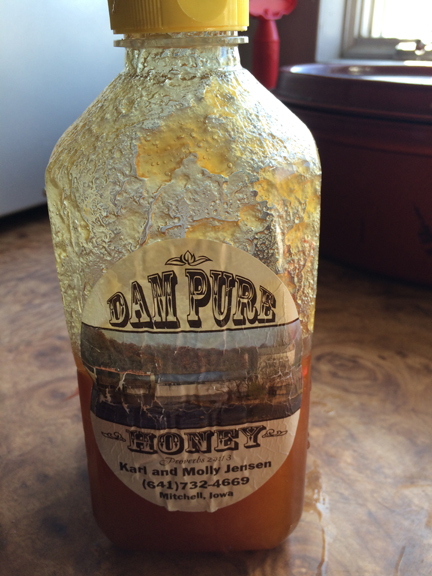 Remember this big jug of tastiness? 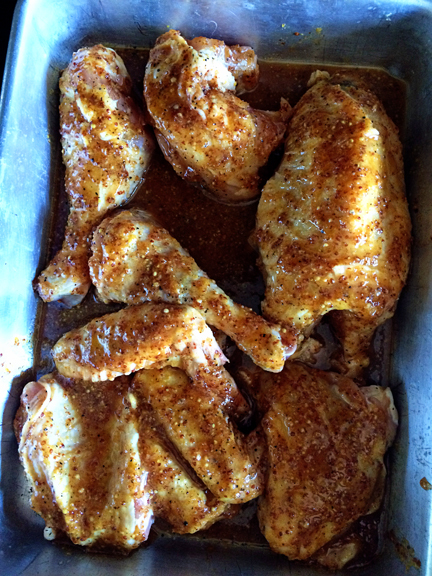 It gets mixed with mustard, lemon juice and paprika. 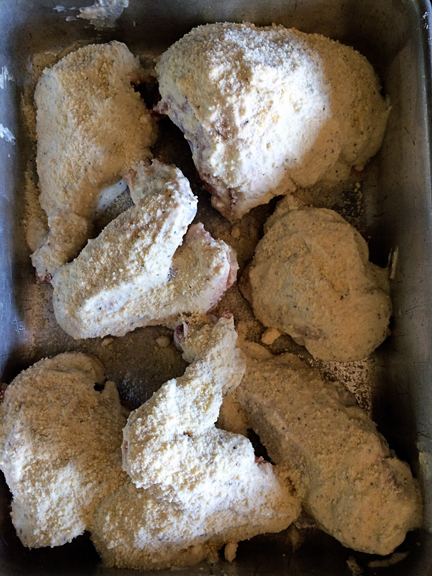 And the whole works gets poured over the chicken. The family loved both recipes. They’ll definitely be on my list to make again soon! 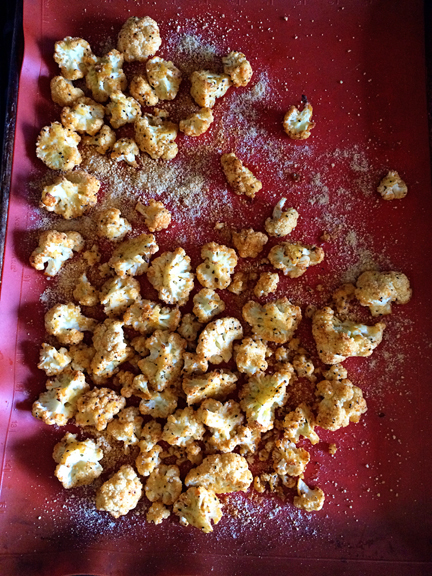 I served them with this great Parmesan Roasted Cauliflower recipe from Back to Her Roots. 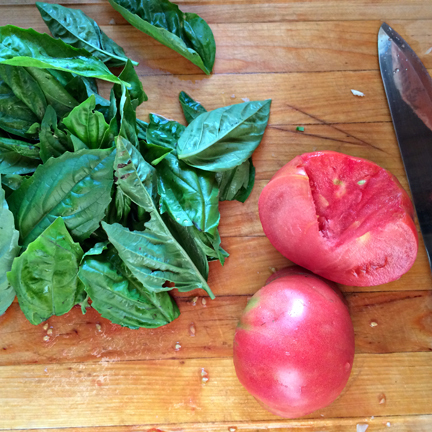 Have you noticed I favor simple recipes with basic ingredients? It’s pretty amazing how much flavor you can get with just a few spices! If this made your mouth water at all, be sure and get your chicken order in! They’ll be ready June 26 and my list is filling up already. 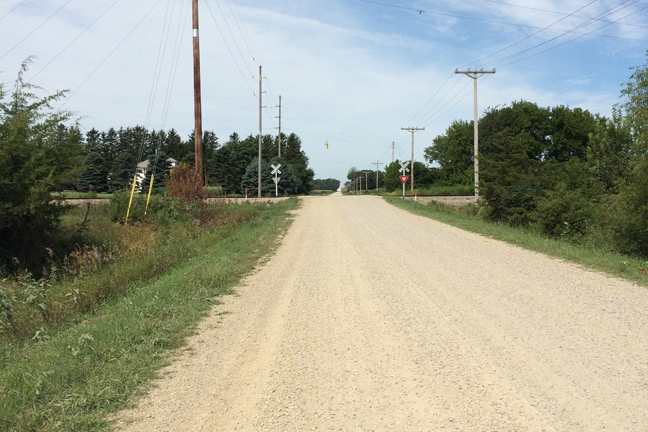 Just call or email your order – contact info is on our about page. I’ve got some seeds started in the basement this year. The brassicas I start 2 seeds to a pot and then clip one seedling out if they both germinate. 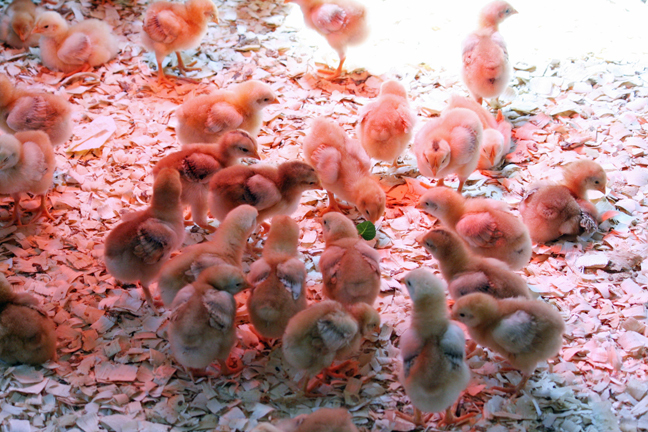 These fresh, tender little greens are perfect for introducing the chicks to foraging before they get moved to pasture. 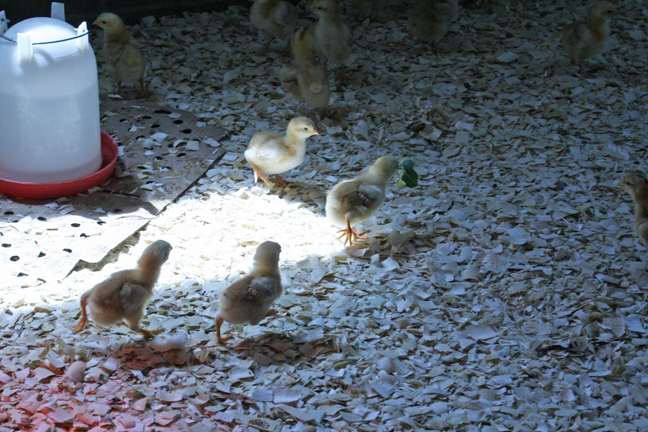 The first time I toss some baby plants in the pen the chicks aren’t sure what to think. They very cautiously check out the alien being that has just fallen from the sky. Soon more chicks gather round. So curious! Finally one brave chick picks up a piece of green. And the race is on! Once one chick has something, the rest of them want it. The have nots chase the have around the pen trying to get him to drop it. That little piece of green will typically change hands – er, beaks – several times before one victorious chick finally eats it. New rug for the mudroom. I don’t imagine it will look this pristine for long. 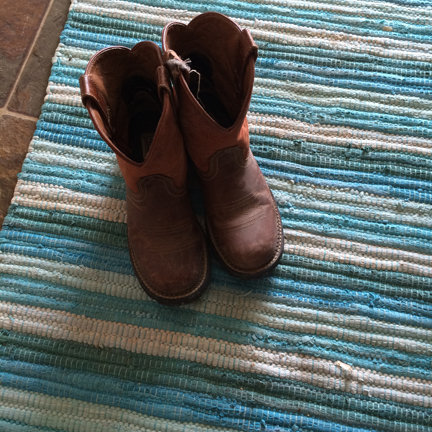 Spring means muddy chore boots and muddy dog paws, all coming through the mudroom. So much mud. Makes me want to skip straight from winter to summer.